There are billion of users love to install different apps in his Android phone. There are a lot of free to use games and apps available on Google Play Store. If you don’t need these apps or games then you have to uninstall them. But what to do if you need to Check and reinstall uninstalled Android apps in Google Play Store. You can easily find and reinstall uninstalled Android games and apps in Google Play Store. 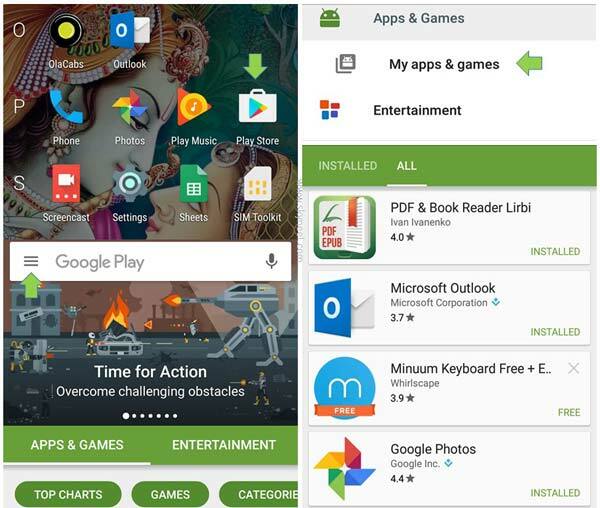 Google Play Store allows you to check the entire list of installed and uninstalled games and apps. If you don’t want to view any app or game in the list then you can easily remove them as per you need. If you want to check the list of all installed and uninstalled Android apps in Google Play store than just take few steps. You can also get all those apps list which you had installed at your previous device. If you want to check and reinstall uninstalled Android apps in Google Play Store, then first you have to be logged in. You have to open Google Play Store on your Android phone, tablet, laptop or PC. Google Play Store have above 1.5 million apps and games. You can easily take following given steps to check and reinstall uninstalled Android apps in Google Play Store. Step 2: Tap on the three dot (Menu) button on the Google Play Store window. Step 3: Tap on the “My Apps & Games”. Now tap on the “All” option to get the entire list of installed or uninstalled apps and games . If any game or app already installed on your Android phone is marked as a “Installed”. If you already uninstalled any game or app is marked as a “Free”. Step 4: If you don’t want to view any unwanted app or game in the list then you can tap on the close (X) option. I hope after reading article you can check and reinstall uninstalled android apps in Google Play Store. You can easily reinstall any required app or games. You can also remove any unwanted app or games from the Google Play Store. If you have any suggestion about this article then write us in the comment box. Thanks to all.